← Will the wood last out? 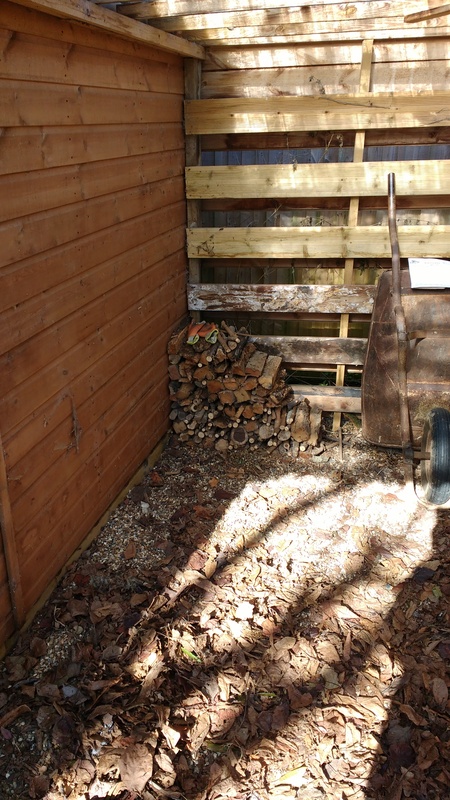 Been heavy on wood, this winter – lots of grey days – so this morning I brought in the last barrow-full of wood from what had been a 6 deep stack that I’d built last summer. To be fair, it was a very full barrow-full. Here’s a picture of that last little pile. Also to be fair, some of the wood wasn’t that good. Some couple of years ago, a friendly farmer let me cut down what was left of a dead tree. It was pretty rotten in places then, and after I’d cut it up and split it and left to it to dry for a couple of years – well the woodworms had had a fine old time. So although there was quite a lot of it, it didn’t last long in the stove. There was a period this winter when a barrow-full would barely last one fire of an evening. So the stacks beside the stove are full but if we need more – and I’m pretty certain we will need more – then it’s going to have to come out of what I’ve earmarked as next year’s wood. The future? I’ve written about this a while ago. I can see a time coming when I shan’t want to cut, split and stack any more wood. Been there, done that, got the callouses (no t-shirt available!). I’ve already got wood for 2 more winters without chatting up farmers or buying in logs. Much of it is already cut and split and then there is the second of the original woodsheds – well, shelters – built of pallets and off cuts from building the house and that itself will be a goodly part of the final stacks. We burnt a fair amount of the first original wood shelter this winter – pallets and the like, and there’s been a good crop of ironmongery. This gets sieved out with the charcoal and, as I don’t want the nails to end up in the compost heap, there’s a second sieving of the ash to get the nails missed on the first sieving – all picked out by hand – and, you’ll be pleased to hear, recycled. And what then? We went to Ecobuild earlier this month, hoping to be able to talk to pellet burner manufacturers and suppliers. Only found one and he was a supplier of large boiler-house equipment. This differed from when we last went, about 3 years ago, when there seemed to be several. Ecobuild had a completely different flavour/topic set this year. We got one contact name which we’ll follow up in due course but I’d hoped to have more conversations and perhaps get some reference sites. When we were specifying equipment for this house, it was not possible to get a pellet burner that you would want to have in your sitting/dining room which put its heat into water, only into space. Those that heated water clearly belonged outside in a boiler house. But time has moved on and it is now possible to get a good looking stove/boiler. But rather than just look at them on the internet, I wanted to talk to people about them and see them for real. Maybe next year. My worry is that they may be noisy. Just wondering if you have nailed down a suitable pellet boiler? You may remember that you generously showed us around your home some 4 years ago as we were hoping to build a similar high spec insulated house. Well it is a long story of planning and after almost 5 years since we engaged with the planners we have won approval. Not for a two storey house as originally planned but a single storey barn style dwelling of around 250m2. Meeting with Touchwood next week to kick it off though have archaeology and bats to sort first. Considering our heating system I’ve looked at pellet boilers but so far I’m not quite sure about them. Cost is high and use probably only a little.